Aslan Yavuz Şir graduated from Bilkent University Department of Political Science in 2004. He earned his MA from Middle East Technical University Department of Eurasian Studies and MS from Department of European Studies in 2007. He’s currently a PhD candidate at the Department of International Relations, Middle East Technical University . Previously he worked as an Expert on International Relations at Global Strategy Institute and Center for Middle Eastern Strategic Studies (ORSAM). 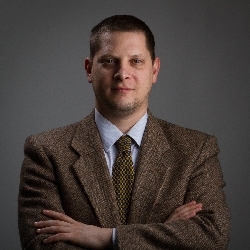 He’s currently working as Senior Expert and Managing Editor at Center for Eurasian Studies. Gürcistan'daki Müslüman Topluluklar: Azınlık Hakları, Kimlik, Siyaset, ed. by: Ayşegül Aydıngün, Ali Asker, Aslan Yavuz Şir, Terazi Yayıncılık, 2016. “Savaş Sonrası Dönemde Gürcistan”, Ortadoğu Analiz, ORSAM, Ankara Cilt 1. Sayı 1.